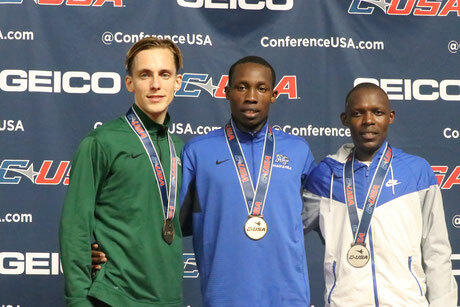 At C-USA Indoor Championships in Birmingham, Alabama, I raced over 5000m and 3000m against strong competition. After a short block of training, I competed in the C-USA Indoor Championships. In last few weeks, training went really well, that's why I was really excited to compare myself with other runners. Since this meet was mainly focused on scoring points for the team, my coach put me into the 5000m and 3000m. This is always an interesting challenge, one night is obviously not enough to fully recover and following that, the second race is quite a mental game. I was mainly excited for the first race, the 5k, since this is my main focus in this season and it was a good way to see where I am at in my preparation for outdoors. Right at the beginning of the 5k I moved into the front part of the pack and tried to stay relaxed. After around 15 laps, I moved into the lead and tried to push the pace. Four other guys were able to keep up with me and a few laps later, the two athletes of Middle Tennessee started to push the pace. I was not able to hang on but it also seemed that the gap to the fourth guy behind me started growing. I kept on pushing but with only two laps to go, he caught and ran past me. I finished the race in 4th, only two seconds off the podium and the time of 14:22.39 was around 16 seconds faster than my time from last year at the same meet. Besides that, this time was also my first school record for UNT. After around 16h of recovery, I toed the line again for the 3000m. I started in the fastest heat and the race was from the first moment pretty intense. There was a lot of pushing, tempo changes and I got spiked a few times. After the first kilometer in 2:48 we were finally able to get a bit more organized and I started to feel comfortable in the race. Around 600m before the finish, I went into the lead with three Middle Tennessee guys following me. They used their team advantage pretty well by setting one guy right in front of me, while another one was attacking, which forced me to run quite a few extra meters. But I was able to get back into third position were I finished the race in a new personal best of 8:21. Generally, I am pretty satisfied with this weekend, every athlete which beat me has quite strong personal bests so I knew it would be difficult to keep up with them. Nevertheless, I tried several times to attack and make them work for their places. I will now have some weeks of training ahead of me before I will start my outdoor campaign.